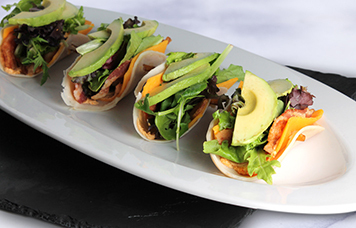 A gluten free way to enjoy all the delicious flavors of a club sandwich. In a small bowl, stir together cream cheese and pesto. Lay one slice of chicken on a flat surface and top with one slice of cheddar. Spread 1 tablespoon of the cream cheese mixture over the top, followed by two pieces of bacon, and desired amount of spring mix and avocado. Fold in half and skewer with a pretzel stick.